Correctly installing and displaying fire safety signs is one of the few mandatory protocols for every business across the UK. In fact, not only does every business need to incorporate these signs, but it is a legal requirement to be able to read and understand these signs in order to enter employment. We want to make sure every business and every person is fully aware of what safety signs mean and how to incorporate them in your business. As such, the team at Cheshire Fire have written this article to detail all you need to know about fire safety signage. 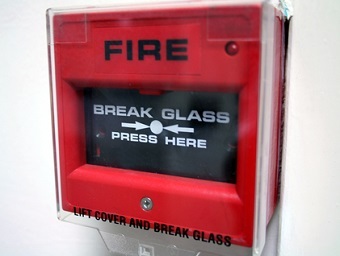 Fire safety signs each follow a nationally universal design so that they are easily recognisable. Each have been designed to incorporate certain shapes and colours to make them easily recognisable and, for some signs — help them stand out. Fire exit signs, for example, are coloured green because green – unlike red – is easier to see in the dark or in the midst of a fire. As noted previously, these signs are categorised into different shapes and colours. Mandatory and prohibitions signs are both circular. Circular signs are mandatory instructions. Warning signs are triangles. Triangular signs warn but do not demand an action be mandatory. Rectangular signs, such as fire equipment and safe condition signs, are signs that guide and label. Fire exit signs must be situated along the exit route, with the arrow pointing in the correct direction. An establishment’s fire signs should not be a mix between European and British standard signs. Here at Cheshire Fire we’re dedicated to ensuring that all establishments have the necessary safety precautions ready in the event of a fire. We offer a huge range of products and services to facilitate this goal, including fire safety training, in which our experts will provide all the relevant and legal information for businesses to be on top of fire safety. If you’d like to hear more, or to learn about the extensive range of products and services we offer, give our team a call today.